With Business Trust support, the Expanded Public Works Programme provided one million work opportunities a year ahead of schedule. In 2005 the Business Trust set up a support programme to help the Department of Public Works accelerate the implementation of the Expanded Public Works Programme (EPWP). The national programme had been established to provide one million work opportunities for the unemployed within five years. The five-year target was met in four years. 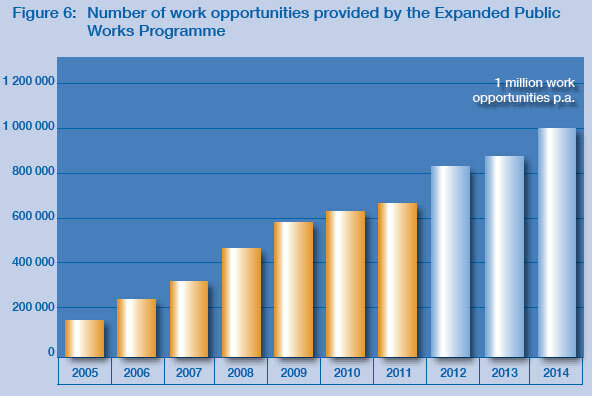 By 2010 it had provided 1,4 million work opportunities, a plan had been developed to expand the programme four-fold, and funding had been secured to take the programme to a new scale. • the number of children benefitting from care increased from 270 000 to 618 000 by 2009. • velop systems, procedures and skills for the expansion of the programme. • 52 targeted assignments undertaken to investigate and clear blockages. • Mid-term review of the Expanded Public Works Programme managed for the Department of Public Works. • Initiatives developed to secure funding for increased capacity. A management information system was developed to increase the application of the public works guidelines and report on work created. The Large Contractor Programme was set up to create an additional 150 000 person years of work. These systems enabled provincial departments of Health, Social Development and Education to implement the Home and Community-based Care and Early Childhood Development programmes, and report on services provided and work opportunities created. • Model developed for increasing labour-intensive domestic waste collection by municipalities. • Enabled municipalities to implement a Food for Waste Programme. This will see a four-fold expansion in the impact of the programme over five years, providing income and work for a million people per year by the end of that period. • a set of systems and procedures for the implementation of the incentive-based scheme for the next phase of the programme. The creation of a support programme by the Business Trust focussed resources and attention on producing targeted results over a sustained five-year engagement with the Department of Public Works. Sustained engagement is needed if a meaningful contribution is to be made to large-scale public programmes. Resources must be mobilised at scale and applied creatively to have a meaningful impact. In this case over R100 million was available. Sufficient skill is required to grapple with the scale and complexity of the problems to be addressed in large-scale public programmes. The Department of Public Works created a special unit with the skills necessary to work effectively in the partnership structures mobilised by the Business Trust.